The trip to Valley of Flowers should have ideally ended on day four but blame the magic or my luck and we landed up at this place- Mana where God lives next door. 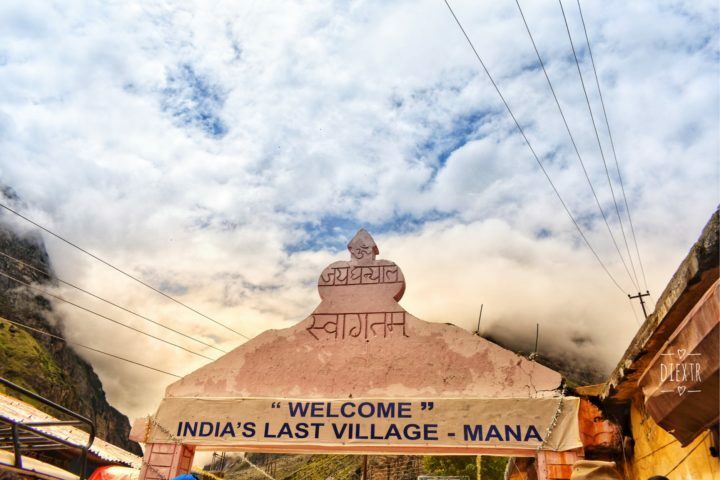 Mana is the last village before the Mana Pass and is 24 km from the border of India and Tibet/China. 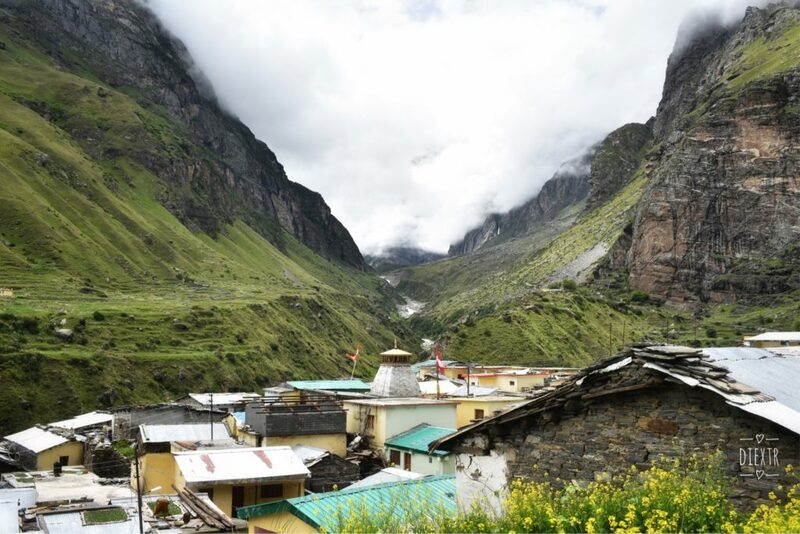 It is located in the district of Chamoli of Uttrakhand at an altitude of 3,200 m.
I entered this village and got introduced to divinity in a rather peculiar way at every stop. It felt like living the bygone era when God really existed in human form. There were tiny houses built on a narrow lane leading up towards the heavenly mountains where women were knitting woolen clothes and every backyard was grown with organic vegetables and flowers. Simplicity struck me hard and all of a sudden life appeared totally unpretentious. Small huts looked like a picture out of a story book. 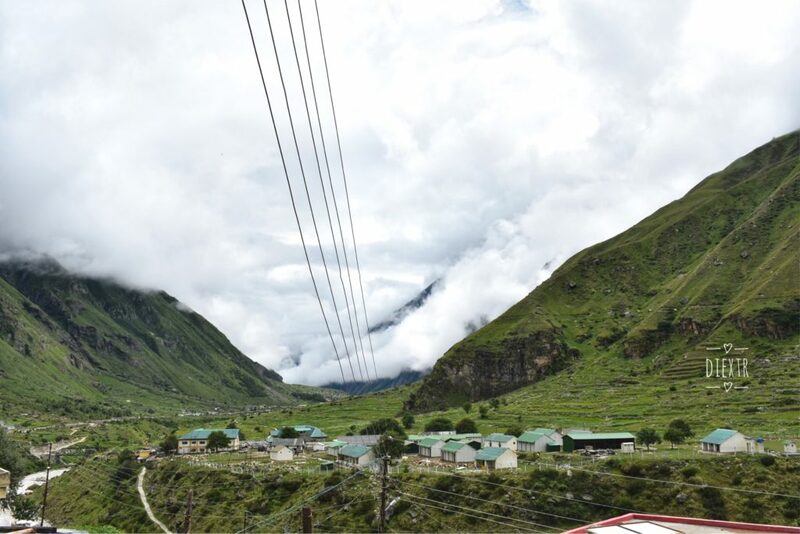 A quaint cottage in the pristine hills where clouds dance often and a paradise appears a turn away, are just a handful of dreams people of this town have been able to live up to. Raise your hands if you have also dreamed of building your own home in the mountains. 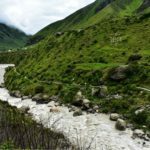 When I walked further, I saw Alaknanda river flowing calmly on my left. The river was just adding gems to this tiny paradise and making the heaven look more heavenly. 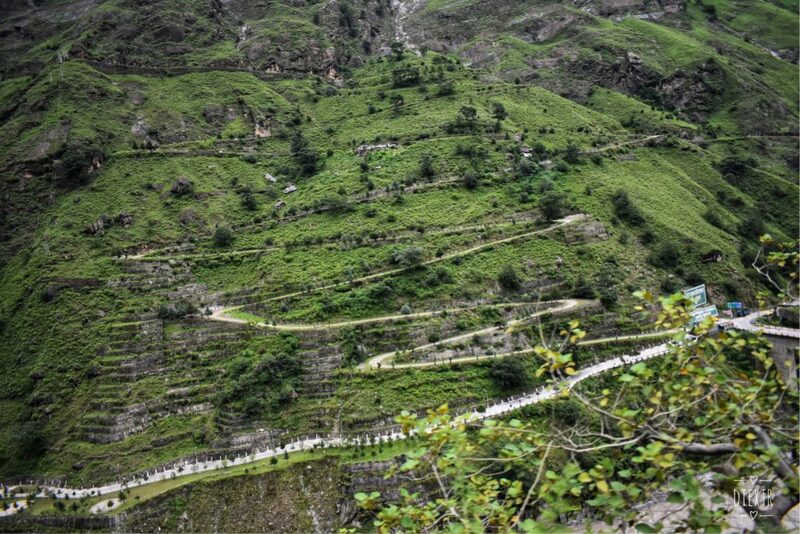 A little way down the pathway, I come to a fork with a signboard that indicates the local landmarks Vyas Gufa , Ganesh Gufa, Keshav Prayag, Saraswati Dham, Bhim Pul and Vasudhara falls. It was intriguing to witness the history scattered along the rustic lanes of this small town. 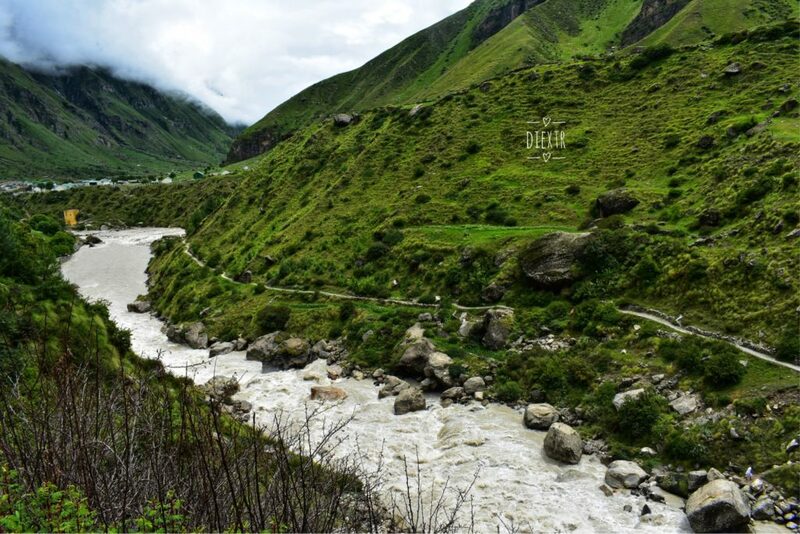 The river is named after the goddess of wisdom and is also known as Gupt Gamini ( hidden river) since it flows mere about 100 m from its origin and joins Alaknanda river at Keshav Prayag. The river then reappear only at Triveni Sangam where it meets the sacred rivers Ganges and Yamuna. 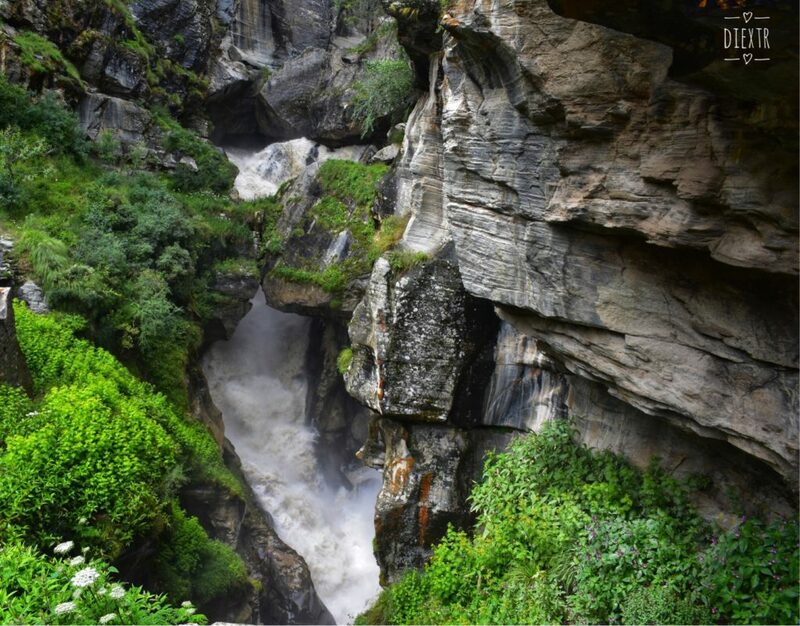 According to the myth, the gurgling flow of the river was disturbing Vyas to focus on Mahabharata and hence he cursed the noisy river to disappear. Although it’s a narrow stream but the noise of the water is deafening. 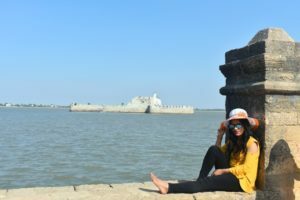 This is one interesting tourist spot which is connected with Mahabharata. 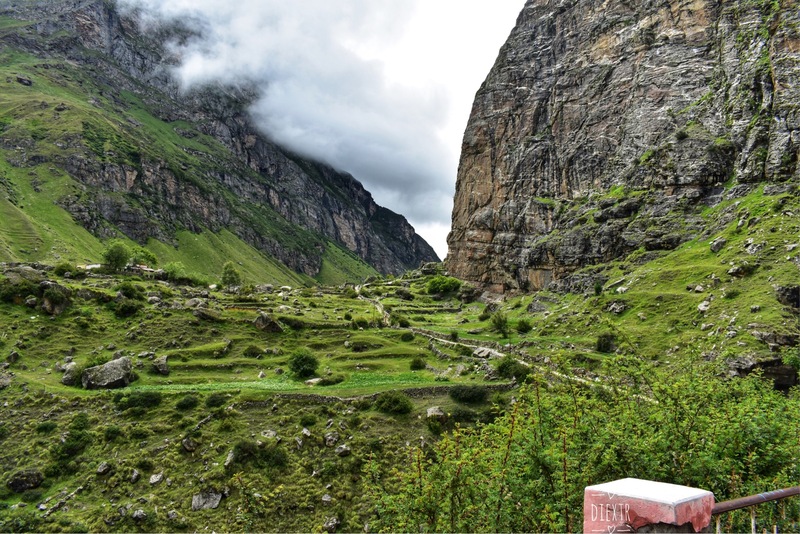 The villagers believed that the pandavas (the five mythological characters from the epic Mahabharata) choose this path to reach the heaven and could not cross the river Saraswati. 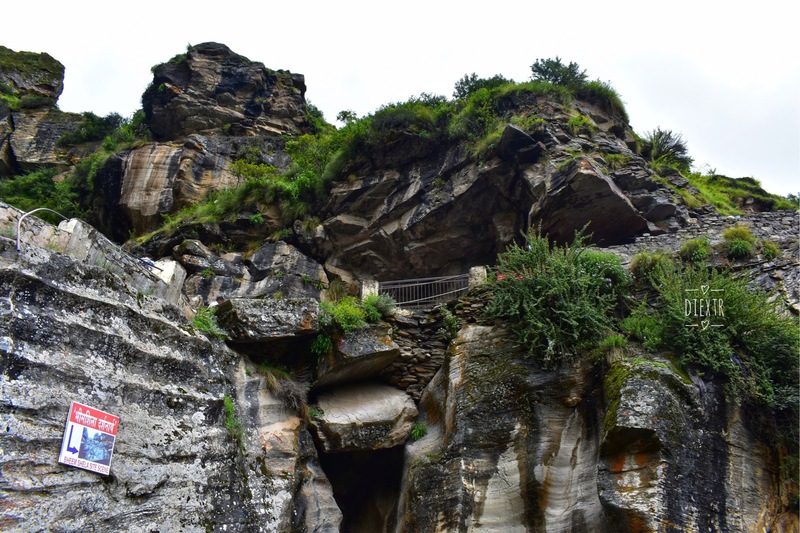 So, Bhima lifted a massive rock and placed it over the river connecting two parts of the hill to help his wife Draupadi cross the river. Right next to the Bhim Pul you can also see a 20 feet tall foot shaped mark on the rock that is said to be the footprint of Bhima. As per Hindu scriptures, the mighty Pandavas traversed through Swargarohini to reach the heaven. However, only one Pandava brother- Yudhisthira and his dog was able to make it to heavenly abode. It is also believed that this is only way one can go to heaven with human body itself. I don’t know about the truth but Swargarohini peak’s vivid topography and its placement amid clouds made me believe in the stories. 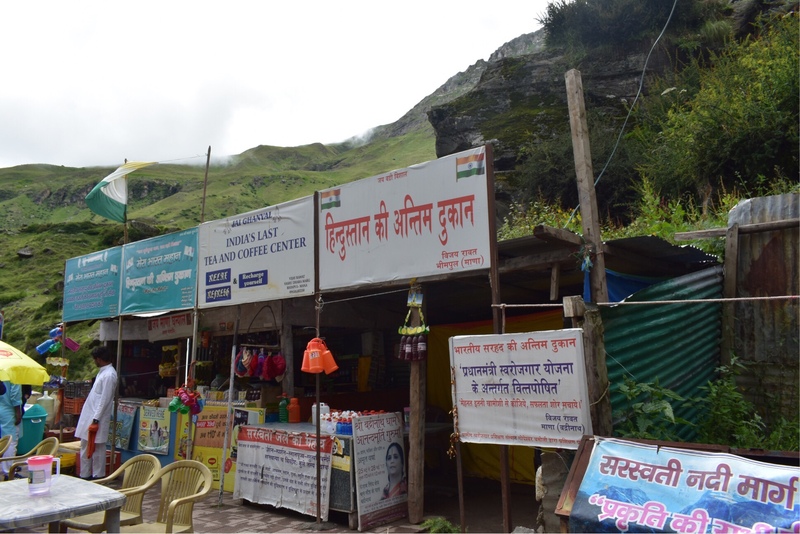 Yes, you head it right, this was indeed the last shop on India Tibet border and the perfect palace to have a Tea/Coffee while relishing the History and the picturesque landscape. 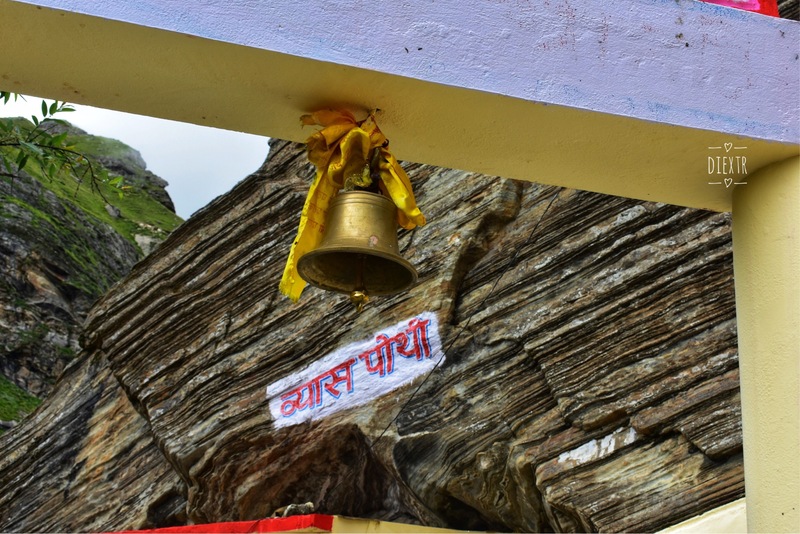 It is believed that Vyas Gufa is the cave where the Ved Vyas, the renowned scholar composed the four sacred Vedas and narrated the Mahabharata for the first time. The Ganesha Gufa is the place where Lord Ganesha has penned down the Mahabharta as narrated by Rishi Ved Vyas. I was excited to see the most sought after temple of India. As I was getting closer to the temple, I can feel the different energy in the air. We stopped by one shop to buy some offerings for the temple. First thing that crossed my mind after seeing the temple was colorful. It resembled more like a Buddhist monastery. 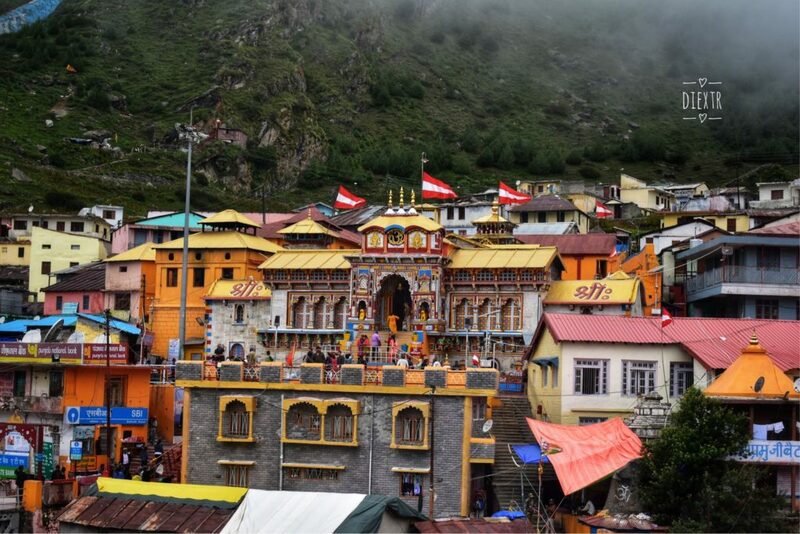 It is one of the reason why it is believed that the present Badrinath temple was Buddhist shrine till 8th Century. Then I walked up towards the sanctum, the eternal bliss spread all across my body while looking at the Idol of Lord Badri Narayan. It felt like an attainment that I had visited the once in a life time Pilgrimage. 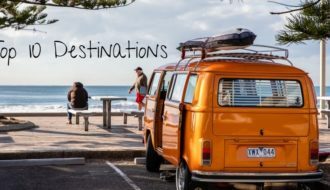 Have you been to an offbeat destination recently? Tell me about it in the comments section below and help me plan my next adventures. 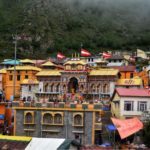 Best time to visit: Best time to visit Badrinath Dham and Mana is during the summer months from June to September. Avoid the month of August when there are heavy rains and the roads get blocked frequently. Inhabitants: They are the last generation of Bhotia community of Mongolian tribes. 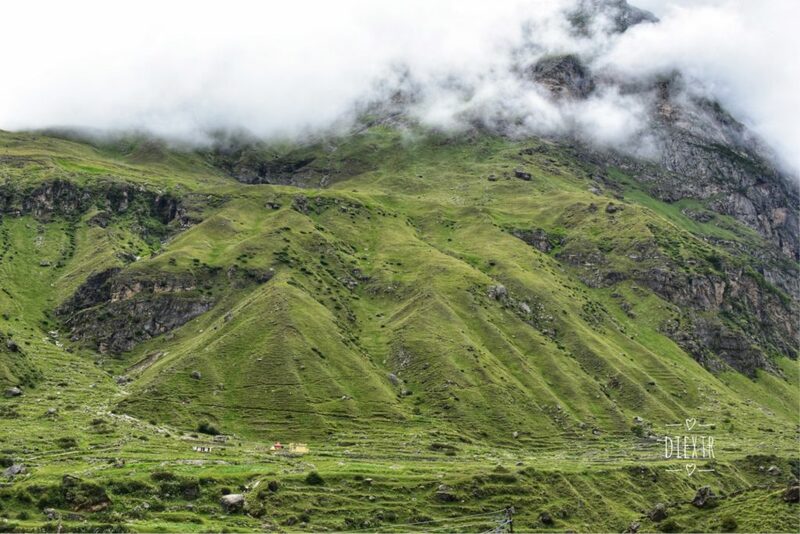 During October to March, because of the extreme winter conditions, they reside at Chamouli, 100 km away from Badrinath. Known for: Mana is famous for its handcrafted woolen shawls and blankets, local herbs, potatoes etc. 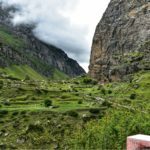 Trekking spots: One can trek many routes like Mana to Vasudhara, Mana to Mana pass, Mana to Satopanth, and Mana to Charanpaduka. 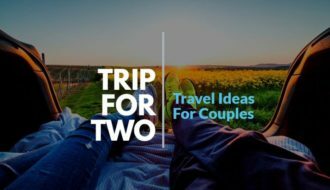 A trek in the hills, a para-glide from the world’s second highest jumping spot, star gazing, a short walk down the unknown trails, buying souvenirs, getting clicked, uncovering the best food outlets, are the activities, I get to indulge in while traveling. 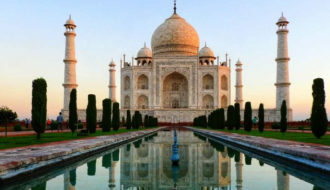 A boat ride from Delhi to Taj Mahal! Reading you post is like revisiting Mana. 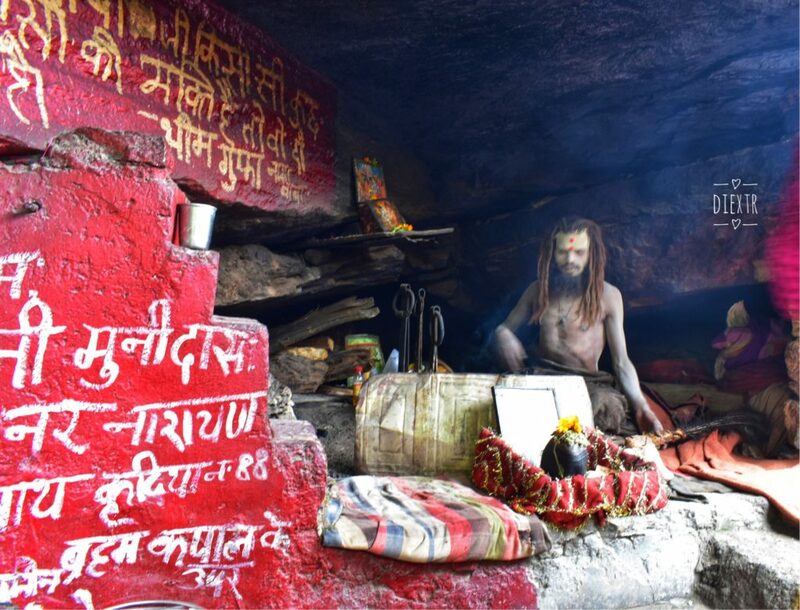 One of the pictures reminded me that the Sadhu immersed in ash was quite rude and demanded money! © Copyright 2019 Diextr. All rights reserved.